Eddie Campbell has recently blogged about the Prize romance comics (It’s just comics- part 4). He has some complimentary things to say about my serial post the Art of Romance. But my suggestion is to visit his blog and scroll down until you find the start of It’s just comics and proceed to read all the parts. It will be worth your while because Campbell has some interesting things to say about the comics of the 50’s. In one chapter Campbell discusses the work Alex Toth did for Standards Comics. Frankly Toth is an artist that I really do not know much about. He never worked for the Simon and Kirby studio and I do not believe he appeared in the comic books that I followed when I was young. Toth is highly praised by a lot of fans. I cannot say I understand what the fans are so excited about but neither am I turned off by what I have seen (unlike some other artists I can think of). Campbell does such a nice job of discussing Toth that I am encouraged to take the plunge and pick up a book about him. I have to admit at this time I am reluctant to purchase anything from the publisher whose book Campbell discusses but there is another book out about Toth that might do very well. It is pleasant to see a blog from such a fine comic book artist as Eddie Campbell. I am a great admirer of the work he did on “From Hell”. I have to admit that I am not familiar with his other work but that should not be interpreted as any reflection on him. Unlike many Kirby fans I think great comics are still being made. In fact in my opinion we are going through a second golden age. Perhaps not in the number of books sold but in the variety and quality of what is being published. The only problem is that I only have the time and money to read a small fraction of what is out there. But I have no doubts that I will at some time read more work by Campbell. So without presenting any evidence and admitting he cannot confirm it, Daniel Best has decided to charge Mike Royer with fraud! I hasten to add that in a comment to post on Bleeding Cool, Mike Royer has denied ghosting the recreated covers (Greg Theakston, Sothebys And The Great Jack Kirby Scam). It is a disgrace that Daniel Best has decided, without any evidence, to smear the reputation of Mike Royer. Joe Simon made an appearance at the New York Comic Con Friday. Joe has not made many public appearances in recent years so this was a special occasion. To be honest, I was not at all certain that he would actual show up. While he is in good health and he gets around his apartment very well, getting to the convention is a difficult and tiring effort for him. But I believe with the Captain America movie, his autobiography “My Life in Comics”, and the just coming out “Simon and Kirby Library: Crime” inspired Joe to make the attempt. The panel was well attended and I believe all had a good time. Everyone sang Happy Birthday as Joe entered the room. I think the only problem was that one hour was not sufficient time for all the stories Joe was trying to tell. After the panel Joe did a signing at the Titan booth. Not surprisingly there was quite a line of people wanting signatures. Joe was only supposed to be at the booth for one hour but it ended up going an extra half hour. Much effort was made to keep the line moving but in the end there were a number of disappointed people. This was regrettable but necessary so that Joe would have enough strength for the trip home. For those fans who did get something signed I trust they realize that they have something very special. For those who were disappointed I can only hope they understand the limitations of someone at the age of 98. 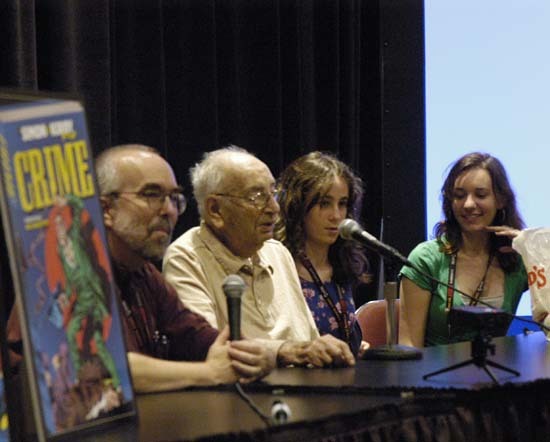 Joe Simon was hired by Timely for the purpose of setting up a bullpen so that the comic book art could be created in-house. Previously Timely’s Marvel Mystery Comics, Daring Mystery Comics and Mystic Comics had be done by Funnies Inc. a shop run by Lloyd Jacquet. In “The Comic Book Makers” Joe says that he was to make things difficult for Funnies Inc. so that they would give up on the features they had doing for Timely. This must have put Joe in a rather awkward situation as he at that time he was also supplying Funnies Inc. with Blue Bolt stories. September 1940 is the earliest cover date that I comfortably assign lettering credits to Howard Ferguson. 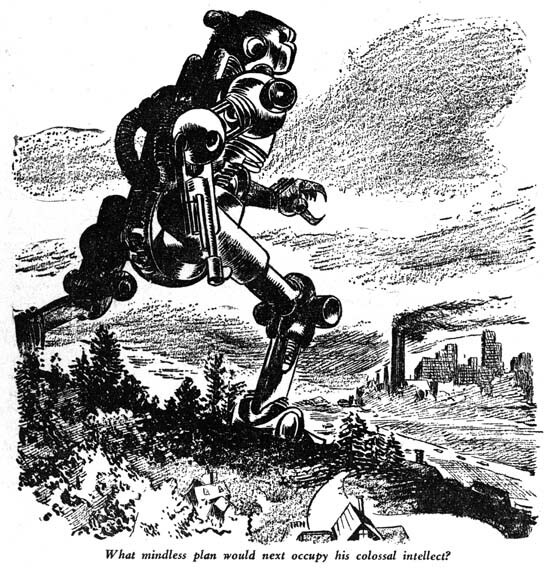 This attribution is mainly based on the special lettering Ferguson applied to the first letter of a caption. This was the comic book equivalent of the oversized and often stylized first letter of a chapter that used to be very popular but has more recently gone out of fashion. 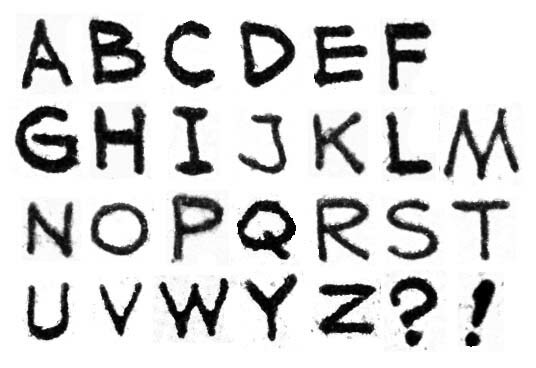 A number of letterers emphasized the first letter often by enlarging and opening up its interior so that it could be colored. Some also included a “shadow” affect to the letter. 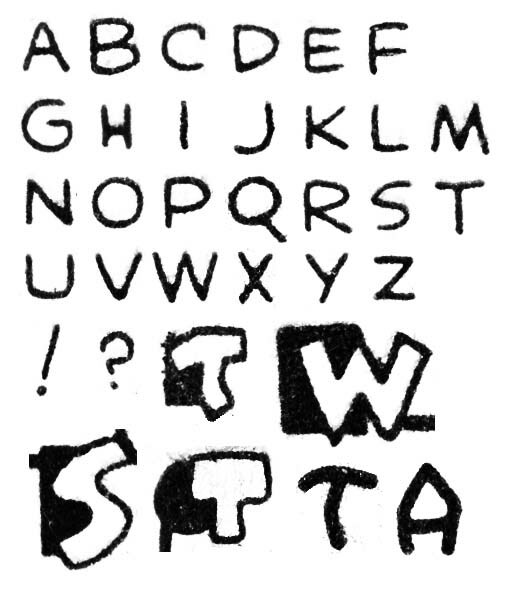 But Ferguson was the only letterer that I am aware of who would place behind the letter not its shadow but an abstract black shape often of a square of circular shape. Todd Klein (Howard Ferguson, letterer) does not seem to appreciate them but I find this technique a great way to attract the attention and provide an element of design to the captions which are often overly plain. 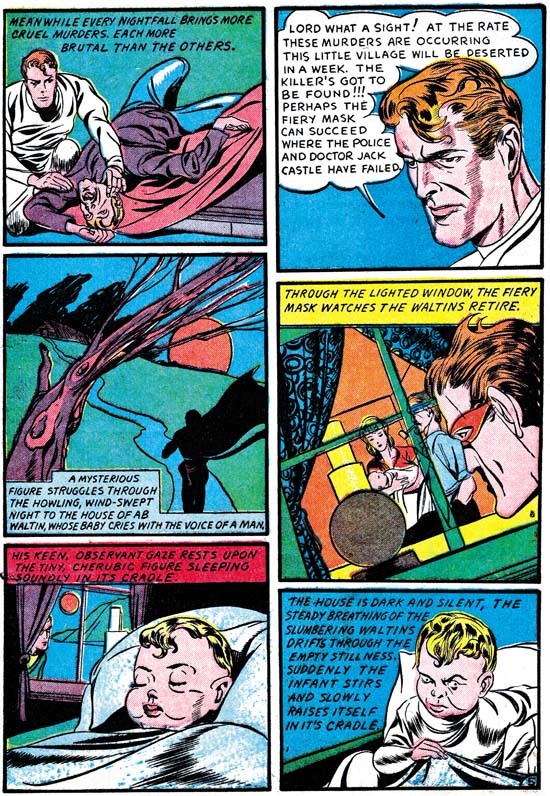 Howard lettered a number of stories release in September but based on the form of the letters he used I believe the earliest ones he did were those for “The Human Torch” and “Terry Vance” stories from Marvel Mystery #11 (September 1940). This may seem odd because these stories were still being provided by Jacquet’s shop. Ferguson seems to make an effort to make his lettering special, in particular the special first letters of the captions. Therefore I find it unlikely that he was moonlighting for Funnies Inc. without Simon being aware of it. Perhaps this was part of Joe’s campaign to make things difficult for the Funnies shop. 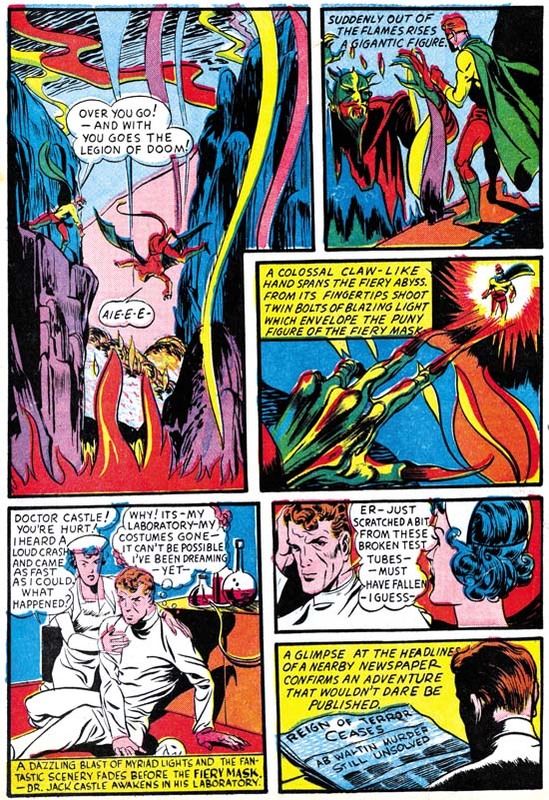 Most captions for the “The Human Torch” and “Terry Vance” from Marvel Mystery #11 (September 1940) have a wavy line for a border. That is except for the one caption found on the splash page. The double line border has been cited as a Ferguson trademark and in fact we will see its use by Ferguson in the future. 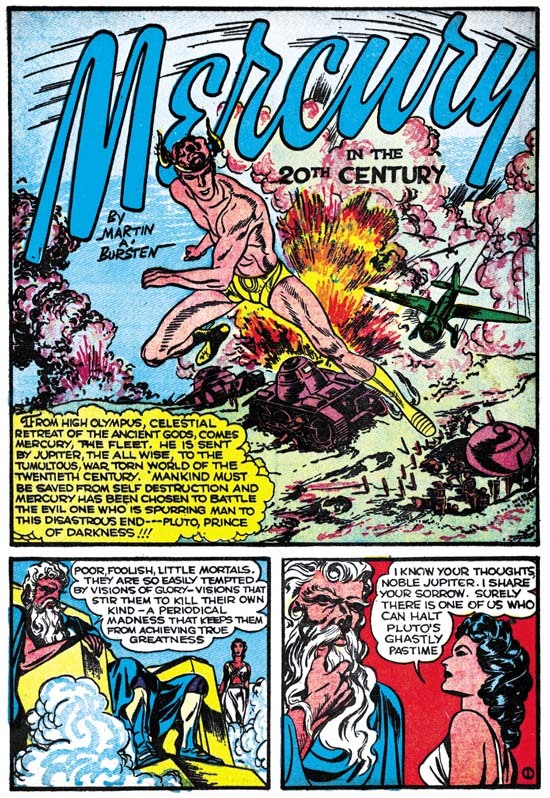 A double line border also appears in the captions throughout “The Human Torch” from Marvel Mystery #10 (August 1940). 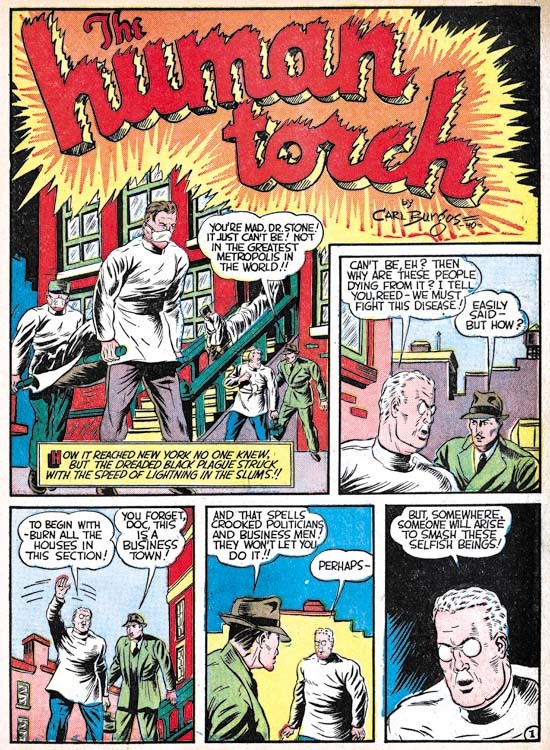 Comparison of the lettering in “The Human Torch” of Marvel Mystery #10 to that found in the same feature from Marvel Mystery #11 suggests that they were not done by the same letterer. Nowhere in MM #10 does the letterer use the special first letters for the captions like Ferguson used for MM #11. The closest the unknown letter gets to that is some over sized and open interior letters. Note the different form used for the letter ‘M’. 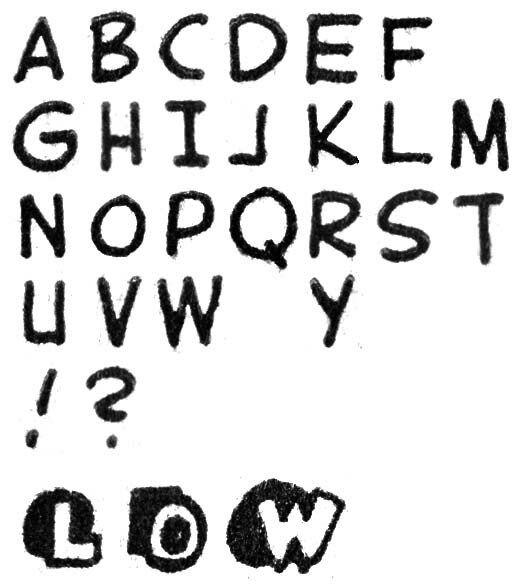 In MM #10 the letter ‘S’ has the lower portion larger than the upper “half” while Ferguson typically did the reverse. But most importantly the letters for MM #10 just did not have the firm hand that Ferguson had. Often the strokes for the letters are not quite straight but curve slightly instead. In some places the letters ‘R’ and ‘K’ are not correctly connected (I provide some examples at the bottom of the letter guide above). 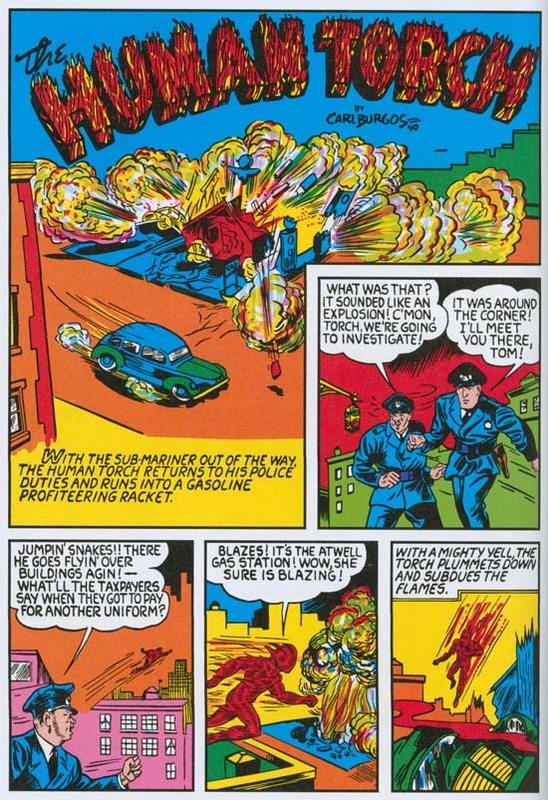 I just do not believe Ferguson lettered “The Human Torch” from Marvel Mystery #10. 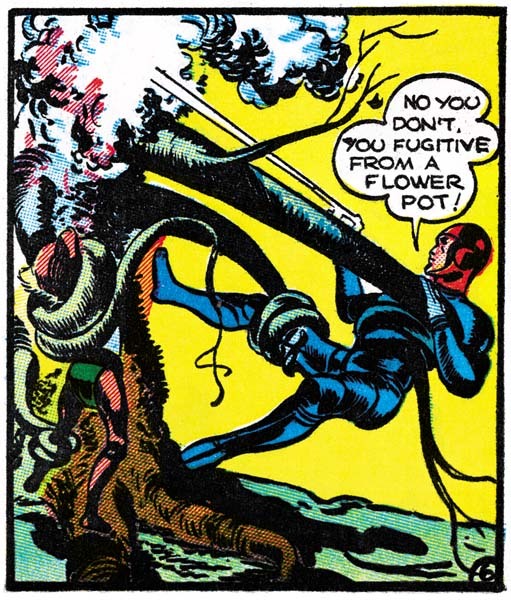 Because of this and the use of this technique by other letterers it does not seem advisable to use double line caption borders as sufficient criteria for crediting lettering to Howard Ferguson. Now that I have Ferguson’s lettering for Marvel Mystery #11 to compare with I want to briefly return to examples from the previous month that some have credited to him. First I would like to compare it to Blue Bolt #3. Note the difference in the letters ‘M’ and ‘W’. In BB #3 the center angle of each does not extend are far as the outer lets while in MM #11 the center angle extends the full distance. Also note the differences between the two for the form of the letter ‘G’ or ‘K’. 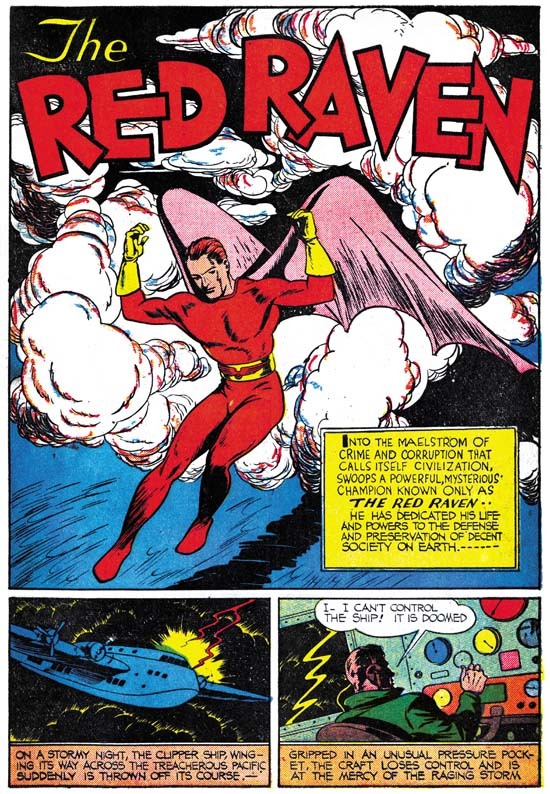 The lettering for Red Raven #1 also differs from Ferguson’s for Marvel Mystery #11. The letters ‘K and ‘Y’ are different between the two. 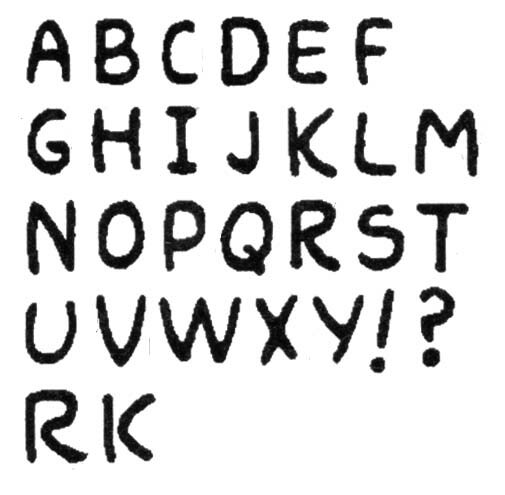 The outer legs for ‘M’ are almost vertical in MM #11 while they have a distinct slant in RR #1. However it will be shown below that Ferguson’s lettering changed somewhat for Daring Mystery #6 done the same month as Marvel Mystery #11. I believe we are seeing Ferguson in the process of learning what for him was a new craft. It is quite possible that Howard had done some lettering for earlier comics. 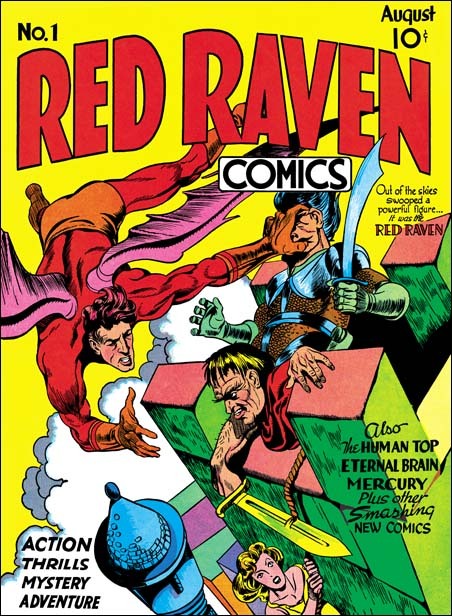 Perhaps the lettering for Red Raven #1, Blue Bolt #3 or Marvel Mystery #10 might have been done by Ferguson only in yet a more primitive stage of his development. The problem is how to identify which, if any, were done by Ferguson particularly since each seems to have been done by a different letterer. At this time I will simply attribute RR #1, BB #3 and MM #11 to an unknown letterers and accept the work in MM #11 as the earliest examples that can confidently be credited to Ferguson. The inside front cover for Marvel Mystery #11 has a black and white house ad which shows the three other titles that Timely was publishing at that time. Red Raven #1 was released in the previous month but being a bi-monthly was still considered the current issue. The fourth panel for the advertisement does not show a cover but advertises a feature, the Fiery Mask. 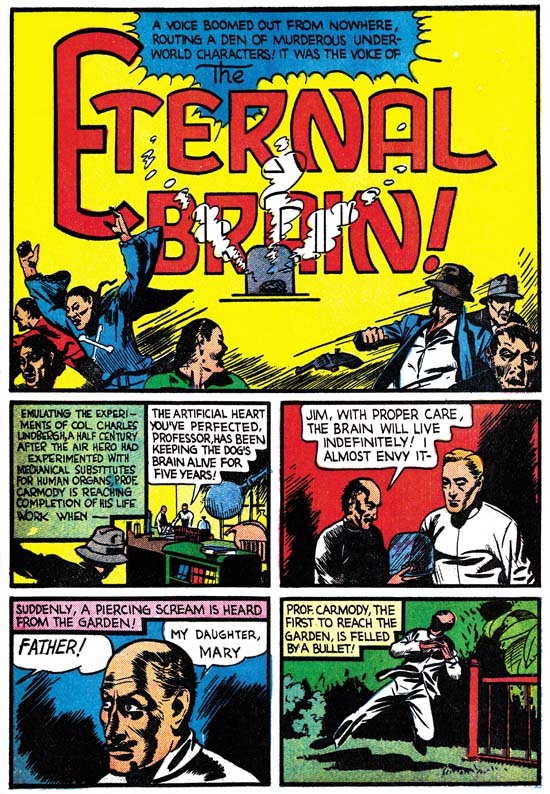 This was a Joe Simon creation that had been included in Daring Mystery although the last couple appearances (Daring Mystery #4 and #5) were not drawn by Simon. The presence of the Fiery Mask in this ad together with the two Kirby covers clearly was an attempt to promote those features which Simon was most responsible for. 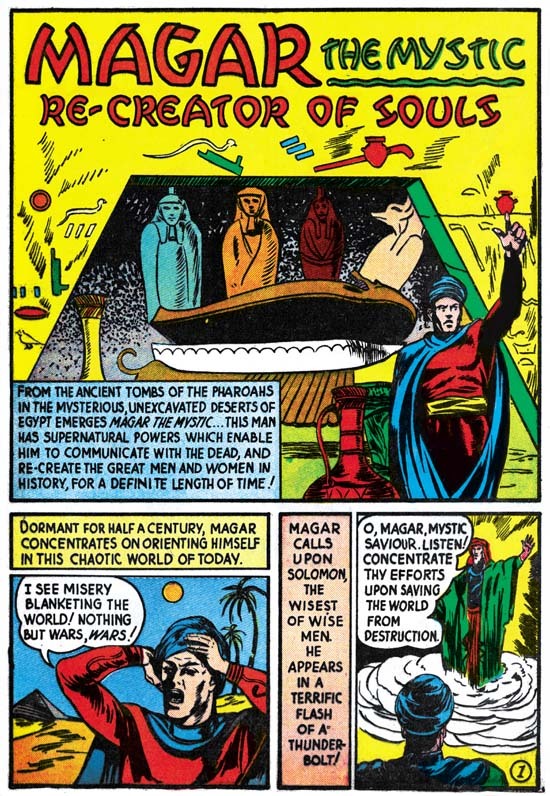 Simon probably had little to do with Mystics Comics #4 that was in the Marvel Mystery #11 house ad. It seems that there is an inconsistency in the dating of that comic with the cover indicating August and the indicia listing it as July. Such discrepancies are not that unusual and I always go with the cover date since it was used for indicating when the comic might be removed from the rack and therefore would generally provide a more reliable date. 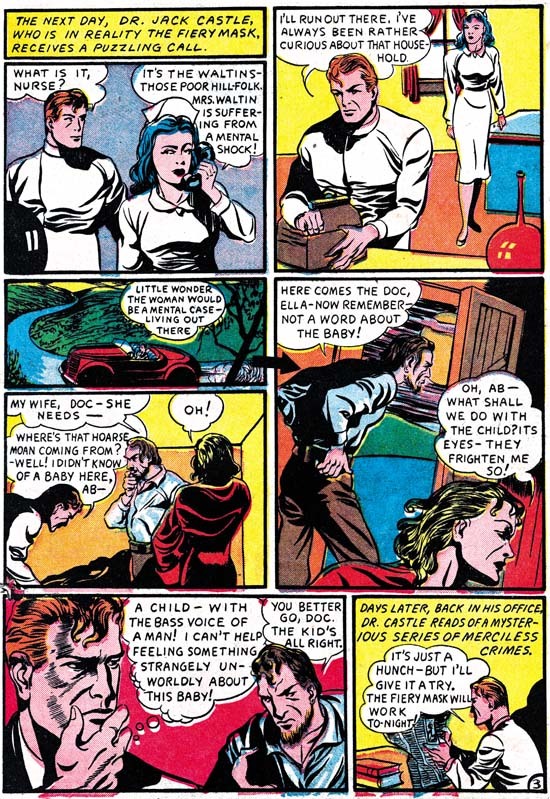 The house ad found in Daring Mystery #6 is entirely given over to the Red Raven #1. All Red Raven features are listed including the short comic filler “Officer O’Krime. 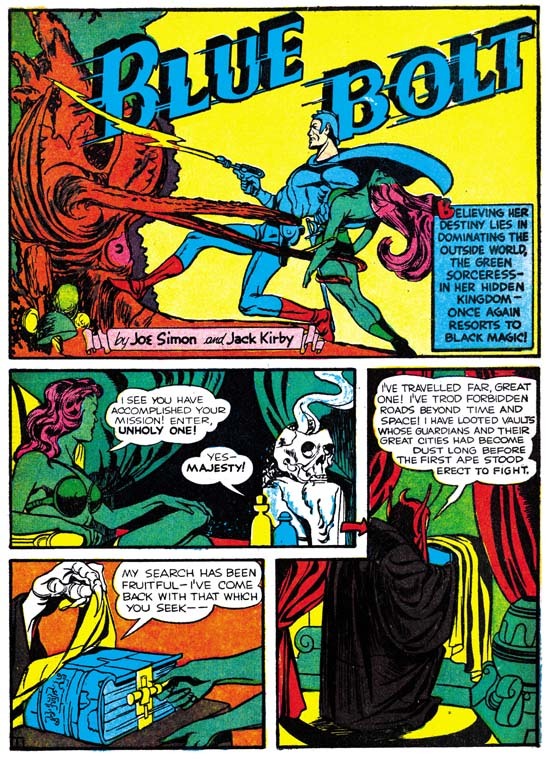 Simon and Kirby involvement in Daring Mystery #6 is obvious as they produced two stories for that issue. 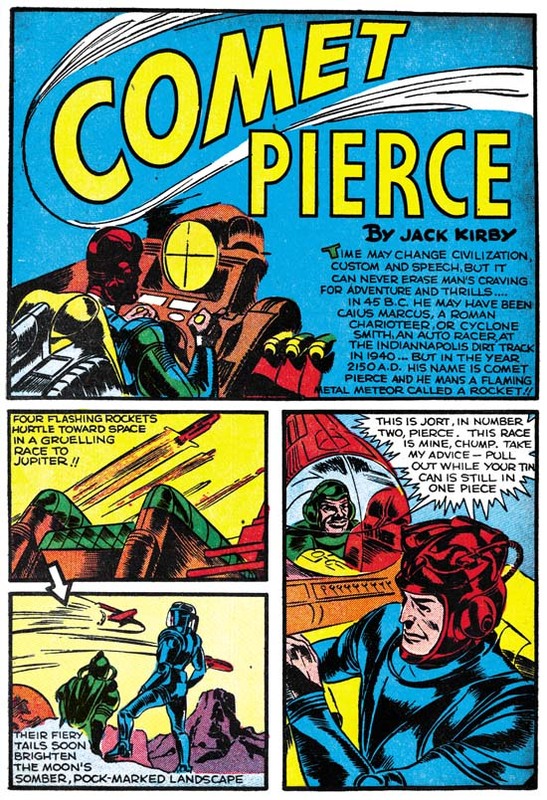 The cover was also a Simon and Kirby production with Jack providing the pencils, Joe the inking and lettering. That it was Simon’s lettering is clear by the letter ‘R’ in the word “their” which sometimes turns up in his lettering (see below for an example). Also the ‘W’ in “new” is done in the typical Simon manner (see below as well). The lettering for the covers of Daring Mystery #6 and Red Raven #1 are really well done. This might come as a surprise considering that Joe himself describes his lettering as not professional. However a really well done story lettering requires both precision and speed, a combination that Joe never mastered in his lettering. On the other hand more time would be expended on covers allowing Simon to use his talent for design and his skills with the brush. 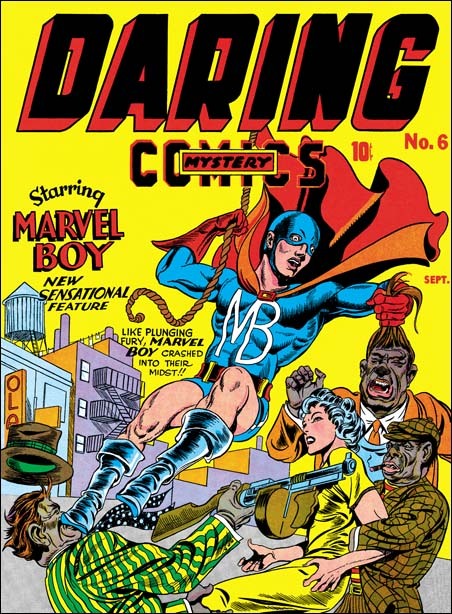 The art for “Introducing Marvel Boy” was created by an unusual assortment of artists. 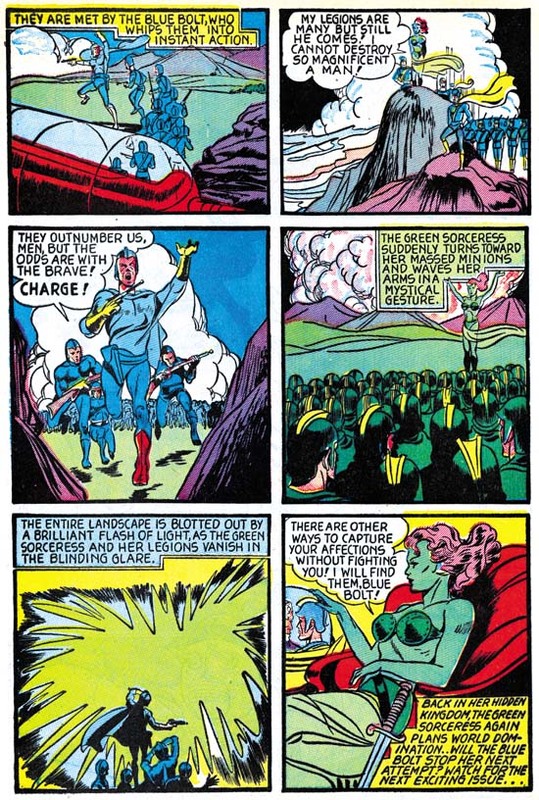 The first three pages were drawn and inked by Joe Simon with no sign of any involvement by Jack Kirby. 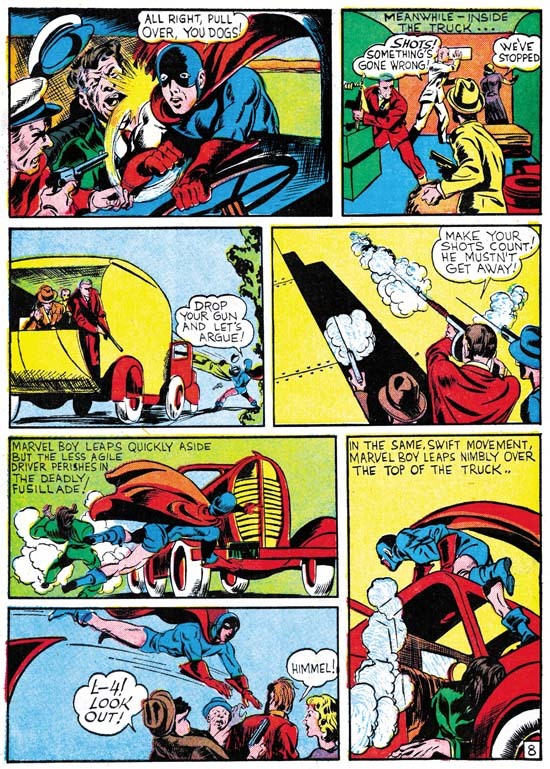 The hero’s gloves, boots and skull cap show would be used again six months later in another Simon and Kirby creation, Captain America. 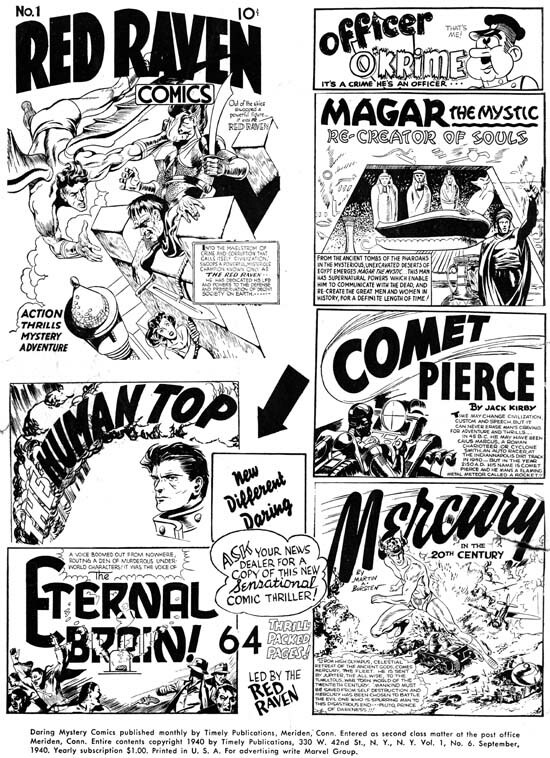 The lettering for the first three pages of the Marvel Boy story, the same pages Simon drew, was done by Howard Ferguson. One of the things that identifies this as Ferguson’s work is the presence of the same first caption letters that we saw in Marvel Mystery #11 (September 1940). Ferguson has even gone further and on the splash page provided the first caption with an enlarged, scripted and colored word “the”. This highlighting of the first word of a caption would appear again in future lettering by Ferguson. 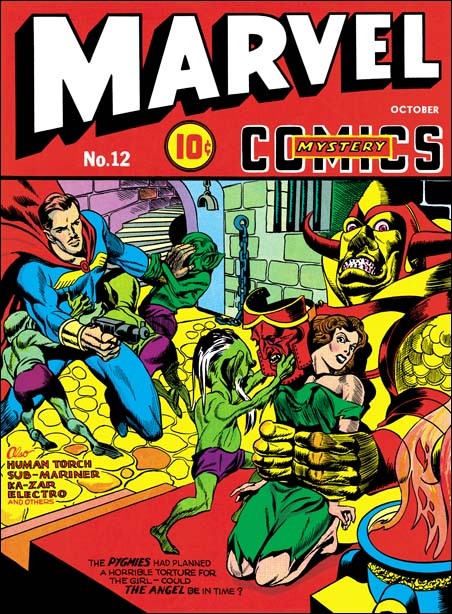 I have previously described Marvel Mystery #11 as providing the earliest work that can be confidently credited to Ferguson. 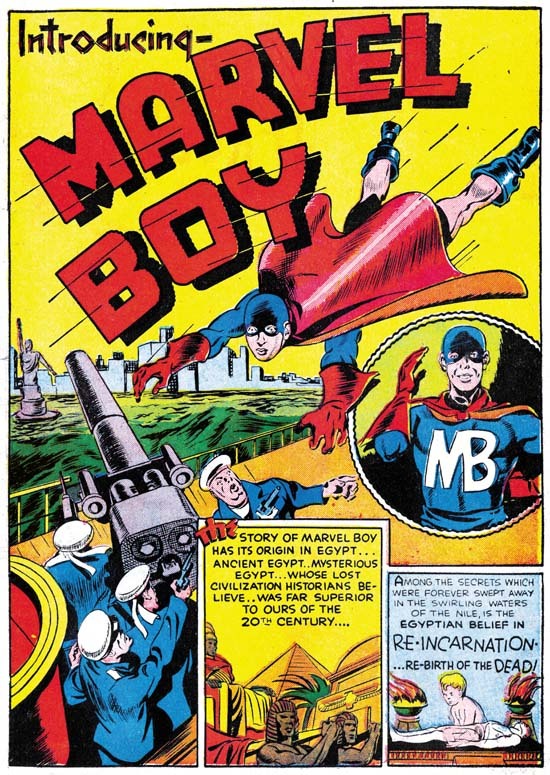 The reason I gave MM #11 that distinction and not this story from DM #6 is that the Marvel Boy story shows the first appearance of a small vertical stroke applied to the letter ‘C’. This would be virtual trademark of Ferguson throughout most of his career and an easy and reliable indicator of his lettering. 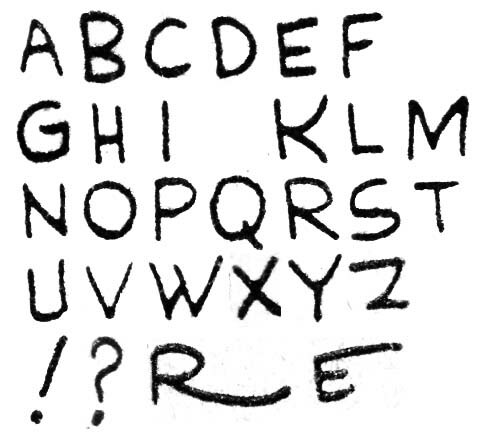 Ferguson has adjusted the letter ‘M’ to his more frequent format with distinctly slanted outer legs although since so many other letterers use this form it is of lesser importance in identifying Howard’s work. Oddly for DM #6 Ferguson has altered his letter ‘K’ to a shape not typical for him at all. But the letter ‘G’ still has not been altered to Ferguson’s more typical later form. While Simon drew the first three pages of the Marvel Boy story it was Jack Kirby who penciled the remaining seven pages. The inking credit for these Kirby pages is hard to determine. Certainly Jack was not inking this work. Perhaps Joe was involved but to me it looks like the work of a number of different inkers. So it seems likely that by this time Simon had hired some studio assistants to help with choirs such as inking. I have been asked a number of times about who did what inking in this early Timely bullpen but to be honest I have not worked that out myself and I am dubious that such inking attributions can be reliably determined. So except for those cases where the inking was done primarily by Kirby or Simon I will leave off inking credits in this serial post. The lettering for the Kirby pages was not done by Ferguson but by Joe Simon. This clearly indicated by the presence of Joe’s rather unique letter ‘W’. While not quite as useful, Joe’s letter ‘M’ is also of use in spotting his lettering. For the most part Simon tries to be more professional than some of his earlier lettering work but occasionally he provides his letters with dramatic extensions such as the ‘R’ and ‘E’ show at the bottom of the above letter samples. Even today Joe likes to use such flairs in his signature. 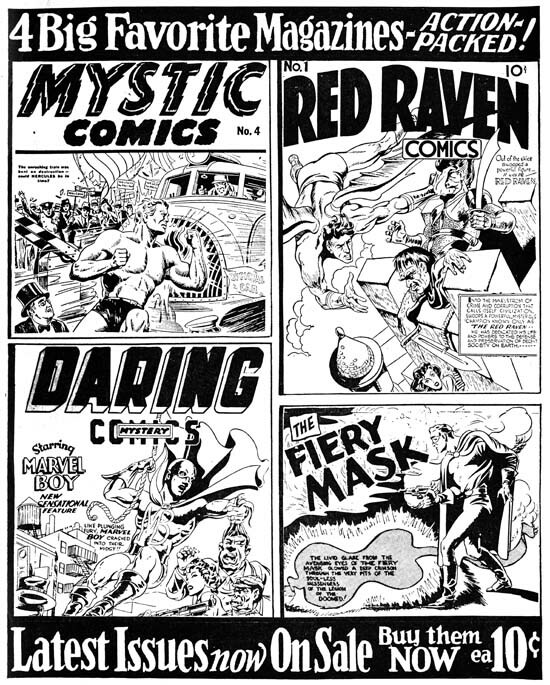 Both Simon and Kirby worked on “The Fiery Mask” story in Daring Mystery #6. Once again it is Joe that penciled the start of the story (pages 1 to 4). Also like the Marvel Boy story, Joe inked his own pages. 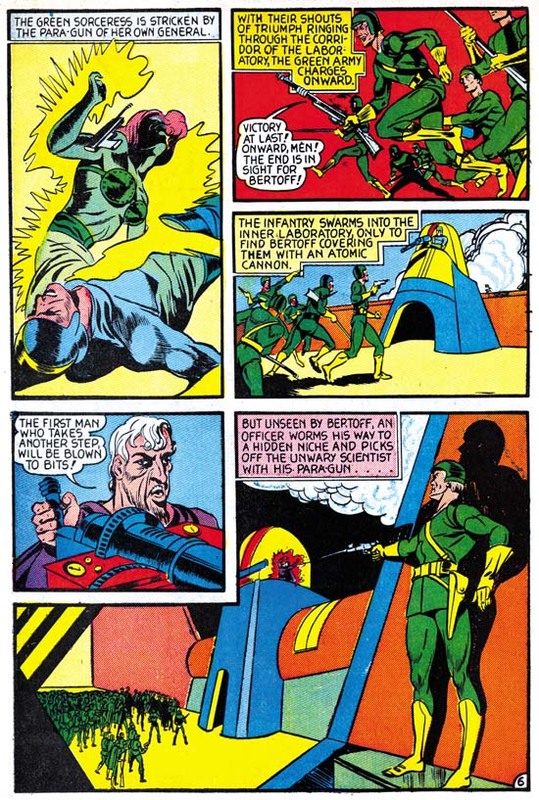 Simon’s pages contain a number of swipes from Alex Raymond’s Flash Gordon (Art by Joe Simon, Chapter 5). Kirby penciled pages 5 to 10 of “The Fiery Mask”. 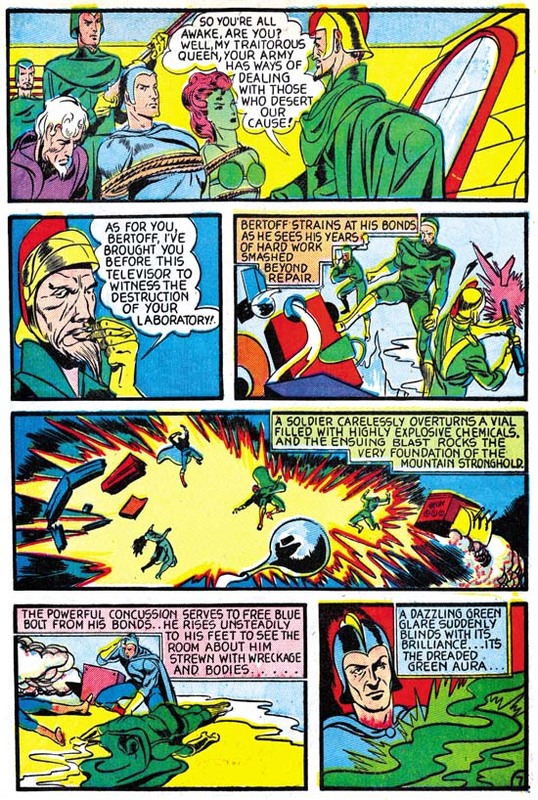 While Simon’s pages include a number of swipes I am not aware of any in those penciled by Kirby. The most likely conclusion is that in this story Kirby is not working from Simon layouts or if he was Jack felt free to alter them. Like the Kirby pages from the Marvel Boy story, the inking seems to have been done by a number of different hands. But Simon’s inking seems present in some places particular the lower half of the last page. However there is some inking using fine lines, such as in the second panel of page 5, that is untypical of Simon. None of the inking seems attributable to Kirby. Daring Mystery #6 (September 1940) “The Fiery Mask” lettering by Joe Simon? The lettering for the Fiery Mask story was handled by two letterers. I very questionably attribute the lettering of the first two pages to Simon. Completely missing is Joe’s characteristic ‘W’ or anything that could be described as flaring of the letters. However the ‘M’ looks very much like Joe’s. 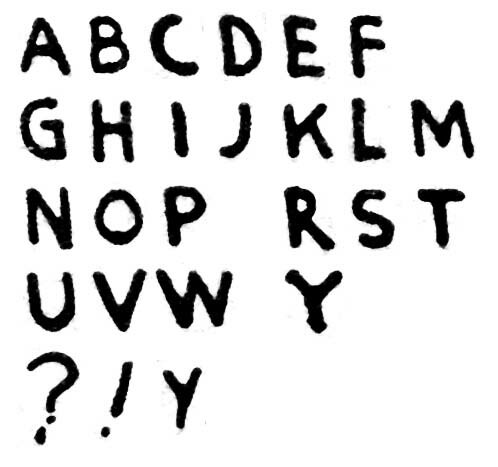 The question mark is similar to Simon’s as well. Further the rather amateurish quality to the lettering is very much in agreement with Simon’s ability. Letter size varies and while all the lettering is vertically oriented in some places it actually slants slightly upward to the left. But I would like to emphasize that the attribution of this letter to Simon is provisional as I have not have had a chance to study some of Joe’s later lettering. Pages 3 to 10 of the Fiery Mask story were done by a different lettering. 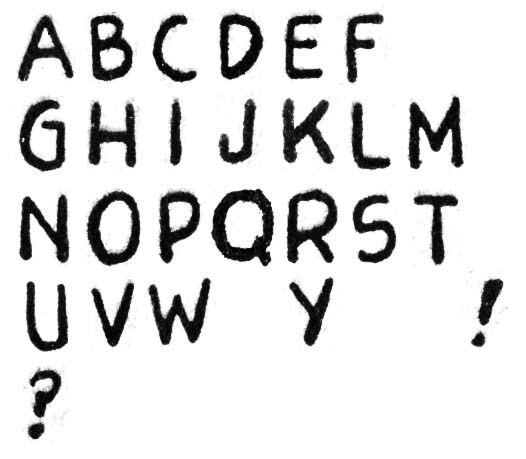 I have taken all the letter examples shown above from the speech balloons where the letters are all vertically oriented. However in all the captions the letters are slanted upward to the right. The letters ‘M’ and ‘Y’ are not like Joe’s. The second letterer does a little more profession job. 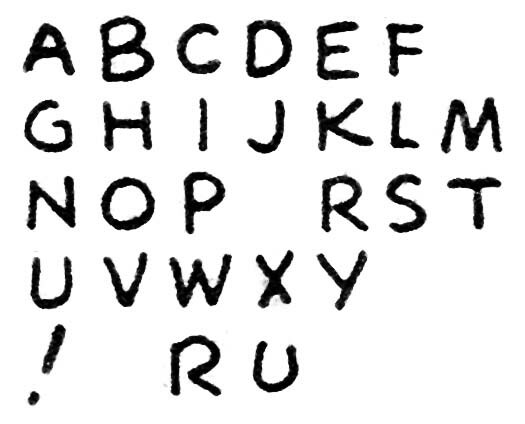 Letter sizes are more consistent and the letters themselves seemed done with firmer control. 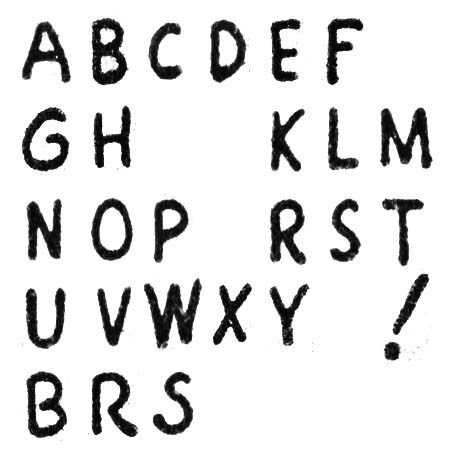 However sometimes the letter ‘R’ lacks the connection as shown at the bottom of the lettering examples above. Also occasionally the ‘U’ gets an almost horseshoe shape. I somehow failed to include an example of Kirby lettering when I discussed Red Raven #1 and so I provide it here. As reported previously, Jack had a very distinctive, horseshoe shaped, letter ‘U’ that is very useful in identifying his work. Kirby’s ‘G’ is also rather distinctive with its small vertical stroke attached to the letter’s hook. 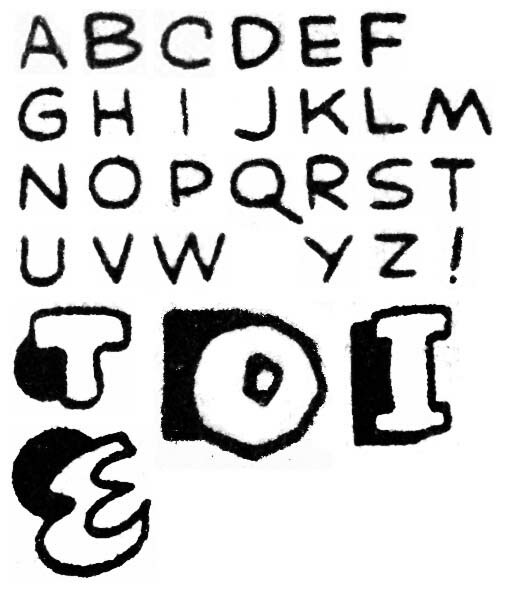 While the second letterer for the Fiery Mask story occasionally makes a horse shoe shape ‘U’ Kirby only occasionally makes one that does not have that shape. Further the second letterer’s ‘G’ lacks Kirby’s unique form. So I do not believe the second letter in the Fiery Mask story is Jack. Still to be discussed is Blue Bolt #4 also cover dated September which I will cover in the next chapter. * I have been forced to use the Marvel Masterworks because I do not have access to original comics for some of the issues that I will be discussing. This is not without risks because Marvel is notorious for the use of recreated art for their reprints. Tuesday (October 11)* will be Joe Simon’s 98th birthday. What with an autobiography, a new Simon and Kirby Library book (crime) and a Captain America movie we have a lot to be grateful to Joe about. I once provided Joe’s email address so that readers could send their best wishes but that turned out to be one of my greatest blunders (despite my asking to keep the information restricted to this blog, it was immediately published on other lists). I am not going to make that mistake again. However I encourage readers to send their greetings to Joe. If you are on Facebook Joe can be reached at here. If you would like to send him an email I will forward any that you send to my email address (hmendryk at yahoo dotcom). If you will be attending the New York Comic Con on Friday (October 14) Joe will be doing a signing at the Titan booth after his panel is over (that starts at 3:45 so I expect Joe to be at the booth after 5:00). Or if you want to leave a video greeting Joe is now on You Tube. * I originally got the day and year mixed up and wrote Thursday as Joe’s birthday. But it turns out that Joe was born on Yom Kippur so by the Jewish calender perhaps today (Saturday) is his birthday. Posted October 1, 2011 in 2011/10, Odds & Ends, Topic, z Archive. There is a new addition to the Simon and Kirby Blog sidebar. The button is not for donations to this blog but for a special project, a Jack Kirby Pop-up Museum. There is a link that provides further explanation on what this project is all about but I would like to make a few comments. Comic books have had a significant impact on our culture. And nobody had more of an impact on comic books than Jack Kirby. 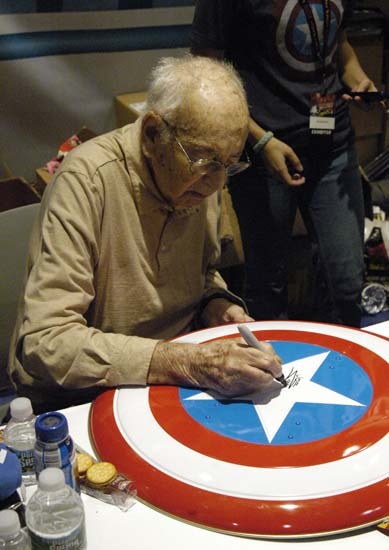 Despite the success of some big budget movies based on comic book characters, often ones that he co-created, the public remains largely ignorant of Kirby and his contributions. Jack deserves a permanent museum but that is a probably too ambitious a goal for right now. But a “pop-up” museum is a very realistic objective, with sufficient help. A Jack Kirby Museum open to the public for a period of a few months would attract a lot of attention and also provide the opportunity for an unprecedented display of Kirby art. So please support this effort with generous contributions. 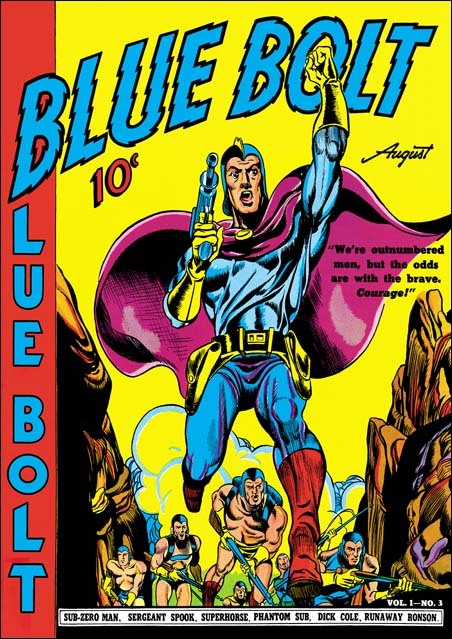 Although Simon and Kirby did 10 issues of Blue Bolt, they only provided 2 covers. 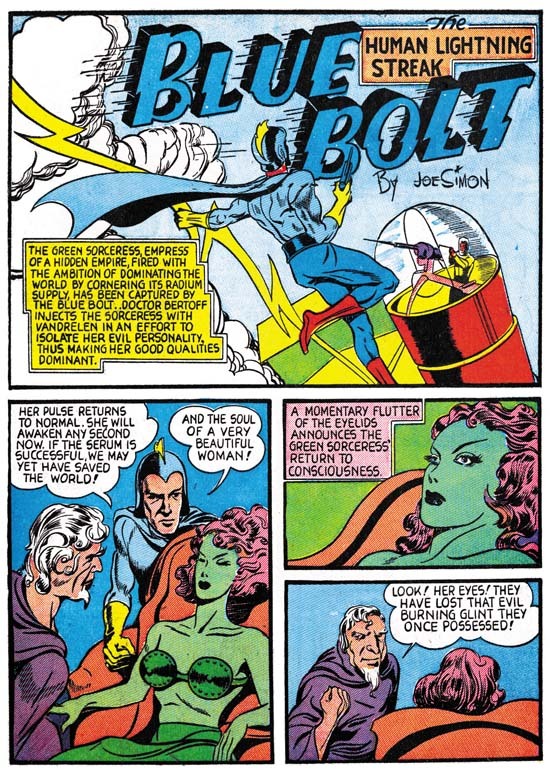 The cover for Blue Bolt #3 is based on a panel from the story that also was done by Joe and it in turn was a swipe from Flash Gordon by Alex Raymond (Art by Joe Simon, Chapter 4, Footnote). But none of them could be described as close copies. For the cover Simon takes an extremely low view point so that we can see the sole of his boot. The men that Blue Bolt is leading appear to be coming over a ridge through a narrow pass. 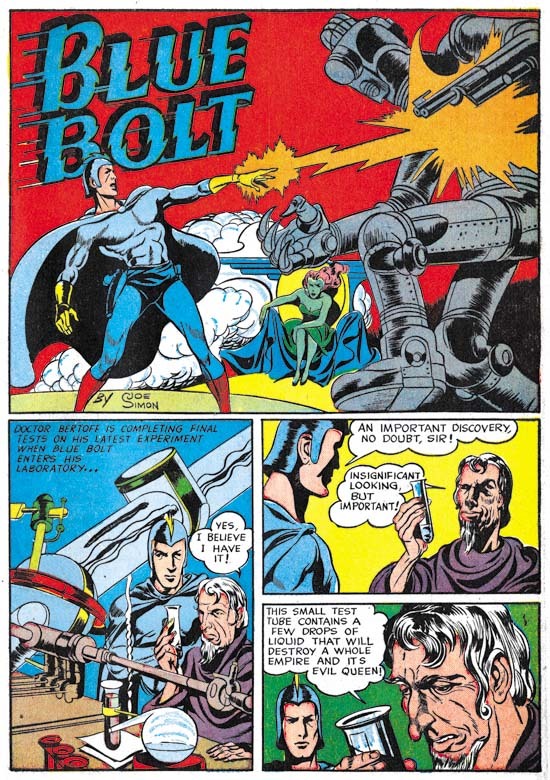 The same Blue Bolt figure appears in panel 3 of page 10. The view point is a little higher than on the cover but still rather low. The background figures are not the same and in the story we can see the soldiers as they advance over a plain. But the story panel still has the narrow pass. Most of the panels on page 10 are distant views which make it harder to see how far Joe’s art has advanced. Page 6 provides closer views allowing that better show his artistic improvement. Simon’s work had already been steadily improving but working with Kirby probably helped. There is a regular improvement as well in the quality of the writing in the first three issues of Blue Bolt. Actually the story for BB #3 is greatly advanced over BB #2. Was this due to Joe learning as he went? Or is it possible that the script was written by someone else? I doubt if Kirby had anything to do with the improvement as his contribution to BB #3 seems so small (see below). In the future most stories would be written by others after which Joe and Jack would rewrite them to give their stories the special Simon and Kirby quality. 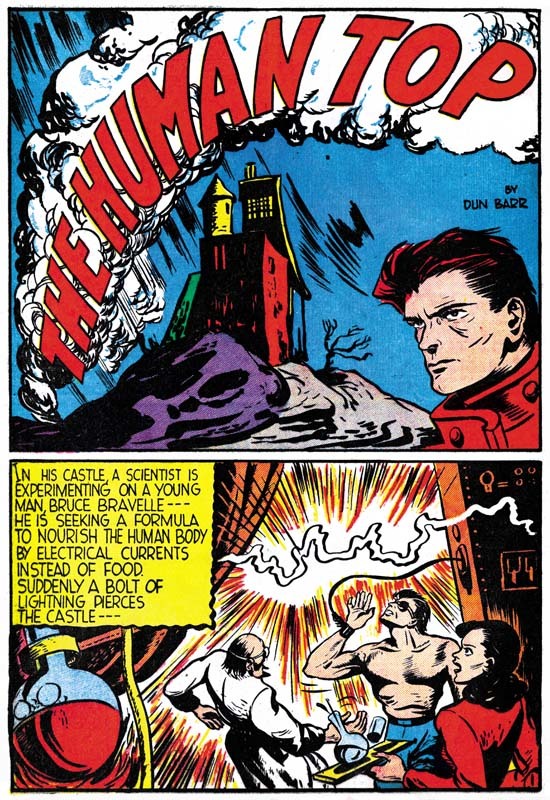 Although the splash panel credits Joe Simon alone, Jack Kirby drew the first page and two other (pages 2 and 7). Whatever their working arrangement was it seems clear that it was not the full partnership that would exist later. Kirby provides even fewer pages for Blue Bolt #3 that he had for BB #2. While Kirby inked his own pages for BB #2 it was Simon that inked Kirby’s pages for BB #3. So Kirby’s contribution had actually diminished. Joe Simon became quite good at inking Jack Kirby’s pencils. So good that it is often difficult to determine who providing the inking. But for BB #3 Joe’s hand is revealed by his handling of eyes and eyebrows which are merged into one angular form. In the previous chapter I suggested someone other than Joe or Jack inked the cover to Champion #9 (July 1940). Now seeing pages from BB #3 like the one shown above I realize that cover was in fact inked by Simon. Note the smooth and stylized folds on the clothing which are like those found on the Champion #9 cover. 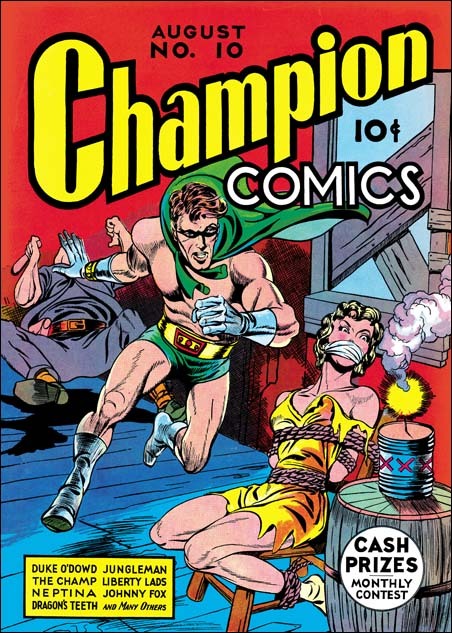 While there is disagreement on what credits should be applied to the art for the covers of Champion #8 (June 1940) and #9 (July 1940) it is pretty much agreed that Kirby drew the Champion #10 cover. Jack is already showing some of his typical traits such as the hero’s unruly hair, the use of exaggerated perspective and a running stride that is more impressive than realistic. The lettering for Blue Bolt #3 is different from that of BB #1 (by Joe Simon) or BB #2 (by an unidentified letterer). 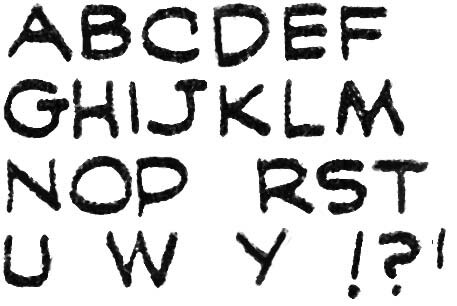 Absent from BB #3 are Simon’s rather unique ‘W’, Kirby’s special horseshoe shaped ‘U’ or BB #2 letterer’s unusual ‘E’. The BB #3 letterer uses a special ‘G’ with a long straight segment that pushes the horizontal bar to a great height. The angular ‘J’ is also unusual but that is not a commonly used letter. Other letters to note are the ‘W’ and ‘M’ where the inner angle does not extend as far as the outer leg segments. Further the ‘M’ has vertical outer lines. Some have suggested that Howard Ferguson did the lettering for BB #3. The timing is certainly possible because at that time Joe Simon had left Fox to become Timely’s first editor where Howard Ferguson was working. I have discussed Ferguson’s lettering (Some Lettering by Howard Ferguson) and I include above an example of his work from just a few months later. They do not look like the same letterer to me. 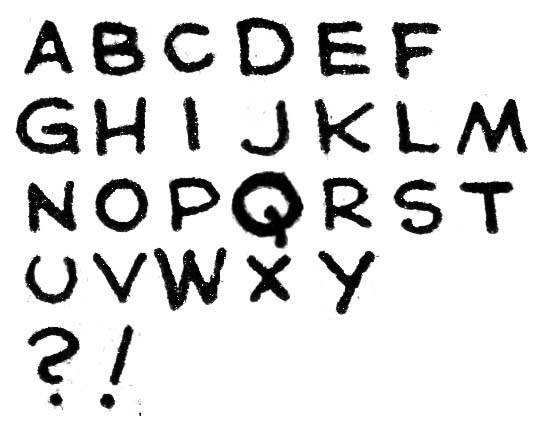 Note the very different forms for the letters ‘C’, ‘G’, ‘J’, ‘K’, ‘M’, and ‘W’. 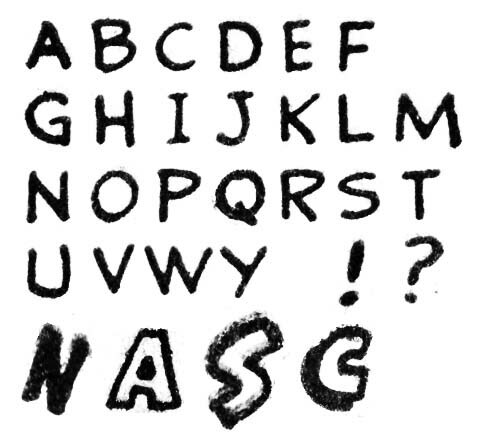 Some have argued that at Ferguson had just begun to do lettering at this time and his work was not initially as professional as it would be later. The suggestion has been made that the unusual double line border to the captions found in BB #3 (see above images) is a Ferguson trademark. However as we will see in a future chapter Ferguson was not the only one using this special caption border. When I started this serial post my intentions were to concentrate on Blue Bolt using it to show the beginnings of the Simon and Kirby collaboration. However I find myself referring more and more to sources outside of that title to clarify what is going on. So I have decided to make this a serial post on the early stages of the Simon and Kirby team up with Blue Bolt as just one of the comics included in the discussion. My new plan is to examine Simon and Kirby up to the creation of Captain America. The first two chapters have been re-titled accordingly but otherwise remain unchanged.